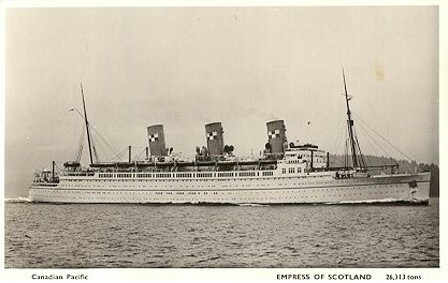 On February 4, 1943 we entrained for Halifax and went aboard the Empress of Scotland along with 4000 RCAF (Royal Canadian Air Force) and 1500 Army troops. My group was billeted on E-deck below the water line, a great place to get sea-sick. On February 5th we left harbor hoping we wouldn’t encounter any mines or submarines, we carried our life jackets, water bottles, emergency ration and greatcoat at all times. We did not sail in a convoy as our ship was very fast, but zig-zagged all the way across to avoid submarines. We had two good meals a day with lots of food because so many were sea-sick. I managed to keep my meals down by staying on deck as much as possible. On February 11th we arrived at Goyrrock Harbor on the Firth of Clyde in Scotland but could not disembark for two days because the sea was too rough. On February 13th we set out on our train trip through Scotland. The people waved flags and cheered as we travelled through the towns. On February 14th we arrived at Milford Station and marched to Laurentide Camp. It was springtime in England and very pleasant. Ernie and Eddie Mills, Tony Armstrong and I made many enjoyable trips to the tea rooms and pubs in the neighborhood. We learned to throw darts and play dominoes with the locals. I was promoted back to Cpl. and did some instructing on small arms. I transferred from Winnipeg Light Infantry to Saskatoon Light Infantry Machine Gun. At Camp Borden I took a first-aid course and a 4.2 inch mortar course. While there Knud Jensen, a classmate from Pinewood School, managed to track me down. He had just won the 3rd Brigade sharpshooter competition and was rewarded with a four day pass, we had a good visit and I was able to give him some of the news from home. He had gone overseas with the first contingent in December 1939. I had a number of weekend passes to London where I saw Trafalgar Square, Piccadilly Circus, London Bridge, St. Paul’s Cathedral, Westminster Abbey, Big Ben and House of Parliament, Buckingham Palace, Cenotaph. Marble Arches, Hyde Park Zoological Gardens, Madame Tussaud’s Wax Works, Beaver Club and many museums. Tony Armstrong and I rented a boat and rowed down the Thames River to Windsor Castle and had a tour of Eton College. On one occasion I spent the night in an underground air raid shelter while the enemy shook the ground with bombs and knocked down a few buildings. On June 1st I was on draft to Camp Caesar (hungry hollow), and awful place. To get away from there some of us tried to transfer to the Paratroop Battalion. Fortunately, as I later realized, I was turned down. According to their regulations I was too tall. Not very many paratroopers survived the drop on Normandy. On June 27, 1943 we were warned for draft, the rumor is that we’ll be the first Canadian troops in action except for the Dieppe raid. This was the end of a very pleasant stay in England. Sicily is very hot and dusty in summer. Most of the people are very poor; some live in caves but most live in villages built on the hill tops. My unit was in reserve, we camped just outside Catania, in one air raid we managed to shoot down two planes, and they went down in the water with a great splash. On October 5th we received orders to join the regiment. 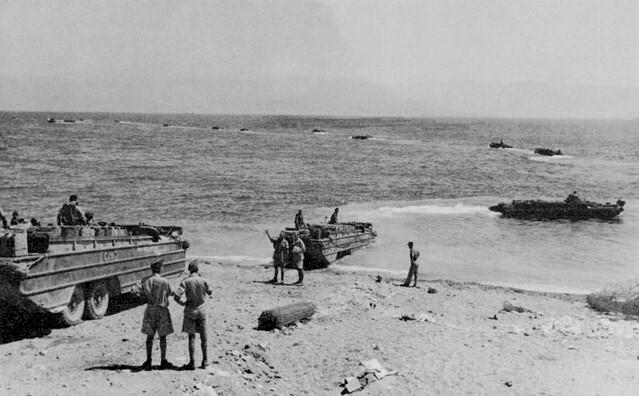 We crossed the Strait of Messina in L.C.I.’s (Landing Craft Infantry). On October 15 we join the regiment near Campo Basra. I ran into Knud Jensen, he had just rejoined his unit back from hospital with malaria. The regiment is over in Italy now but we have been living the good life in reserve near Catania in Sicily. I have been on water fatigue lately. We haul water with a captured enemy half-track. We are all suffering from desert sores and dysentery. The sores are painted with blue ointment which does neither good nor harm. These problems all disappear including malaria when we move into the mountains and it gets colder. On October 5th we get orders to pack and fall out in full marching order which means webbing, water bottle, haversack large pack, three blankets, kit bag, gas mask, and rifle. We march one mile to the docks and board L.C.I.’s (Landing Craft Infantry). We sail all day, our kit is soaked in heavy rain. At 1600 hrs., we land in Toranto but stay on board the L.C.I.’s. In the morning we shoulder our kits and march five miles in blistering heat to the proverbial muddy olive grove where we camp. Next morning I’m relaxing on the latrine which, in this case, is a ten foot pole placed on two posts over a three foot deep trench. When I looked up my old friend from back home, Knud Jensen, is sitting beside me. It turned out he had been evacuated with malaria and was making his way up the regiment. We talked all day and Knud caught up on the news from back home. He had enlisted in 1939 and never had a leave before going overseas. I pitched my pup tent 4 X 6 X 4 feet high. Knud brought over his blankets and we talked half the night. He was quite pessimistic about surviving the war. The regiment already had a large number of casualties and no end in sight. He told me he was engaged to a nurse back in England and if we both managed to get back he would like me to be best man at his wedding. He was a qualified driver mechanic and had hopes of starting a small garage somewhere in the neighborhood when he got back home. On the 20th of December First Division was moving forward for the attack on Ortona, my company was stopped on the road to let 2nd Brigade go by, I heard someone call my name and to my surprise Knud was just passing by, he stopped and we talked for a couple of minutes. Later, when we moved forward, I saw Knud directing his company into a small wood. After we pulled into our area I started out to have a visit with Knud but it was getting dark and I was afraid our sentries would fire on me when I returned to our lines so I turned back. On January 8, 1944 one of the boys from 2nd Brigade told me that Knud had been killed. On January 30th I met a fellow from Knud’s company, he said that on January 3rd they were holding a little town called Pte. S Toirnaso, a few hundred yards from our Death Valley, when the 88mm cannon opened up on them. Knud was struck in the head with shrapnel and died instantly. I found it hard to write to Knud’s parents, it seems more difficult when it is someone you know from back home.